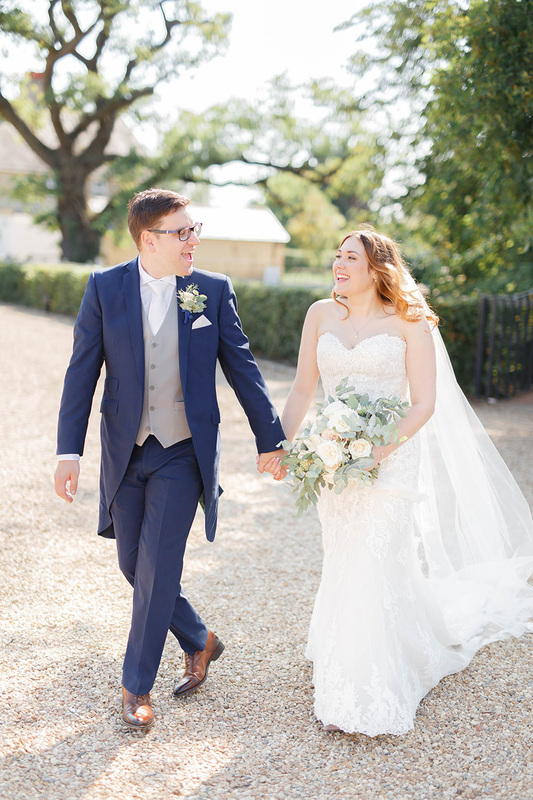 Finding their dream Cambridgeshire wedding venue, Lucy and Matt’s early-September celebration at Bassmead Manor Barns featured a delicate colour scheme, fabulous flowers, exceptional entertainment and an exquisite menu. 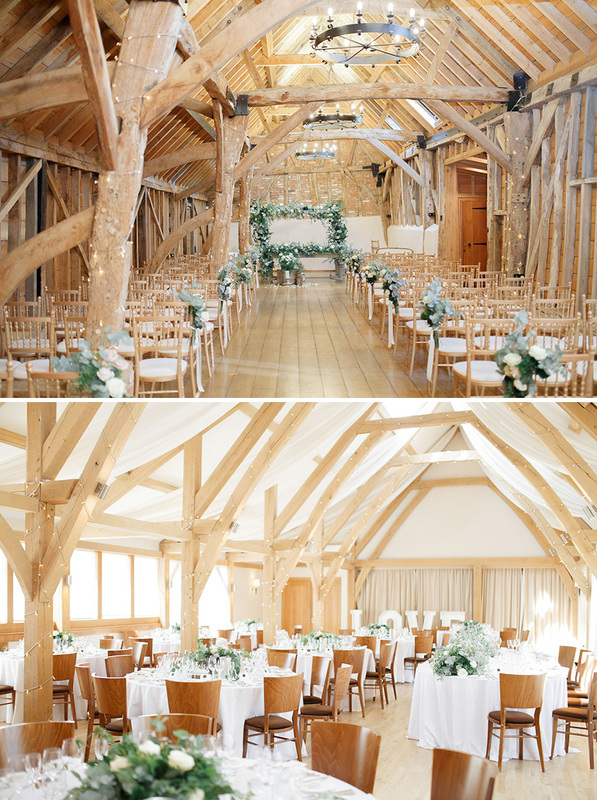 With a September wedding date in mind, Lucy and Matt were on the hunt for an elegant barn wedding venue in Cambridgeshire where they could celebrate their entire day. With a stylish colour scheme of racing green, grey, silver and white, the happy couple adorned Bassmead Manor Barns in beautiful floral arrangements. Highlighting the natural beauty of the venue, many of the decorations were made from wood, from an engraved wooden table plan to a wooden photo board and signage. Acrylic signs were used for table numbers. “I liked that they were different from anything I’d seen before,” explains Lucy. Beautiful floristry linked the areas of the barn together, from the rustic arch in the Rickety Barn to the same flowers in aisle ends and on centrepieces. The bride was stunning in a strapless gown with sweetheart neckline and pearl beading from Essence of Australia. “It wasn’t what I was expecting to wear but I fell in love with it when I tried it on,” says Lucy. She completed the look with pearl jewellery and a pair of pink suede Rockstuds by Valentino. “I loved that they weren’t traditional shoes so that I could wear them after the wedding,” she continues. Meanwhile, Matt and his groomsmen looked the part in navy suits by Ted Baker and the three bridesmaids were beautiful in taupe-coloured dresses by Dessy. Following their romantic ceremony in the Rickety Barn, Elderflower Cosmos and Berry Blush cocktails were served alongside delicious canapés. A harpist and singer, Cerian, delighted the newlyweds and their guests. Moving in to dine, Lucy and Matt had spent a lot of time choosing the perfect menu. Pan-fried John Dory was served to start, followed by an amuse bouche and Beef Wellington for main course. For pudding, the trio of desserts proved a popular choice. To welcome evening guests, a second drinks reception featured a martini bar serving espresso and passion fruit flavours. A four-piece band, ‘One Night Only’ filled the dancefloor with a folk / pop style and Lucy and Matt danced their first dance to ‘Latch’ by Andrea Begley. Wood-fired pizza was served and Lucy’s mum created a treat table with all their favourites, from fudge to cornflake cakes, chocolate-dipped pretzels and meringues – a sweet delight!